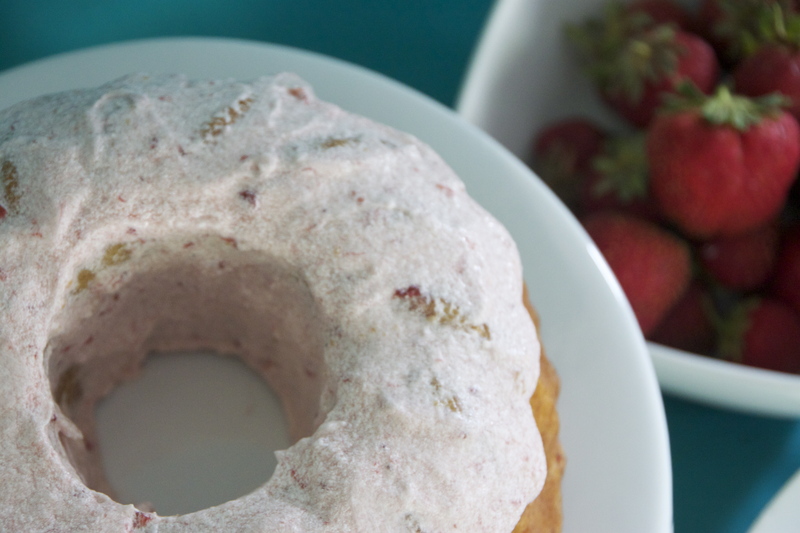 Strawberry Cake… Fresh Baked Friday! Can you believe it? I know. FRESH BAKED FRIDAY! During our Charleston trip, we spent an afternoon learning to make low country cuisine at Charleston Cooks!, a great kitchen store that has a demo kitchen attached. The meal included blackened fish, southern succotash and fresh strawberry cake. Everything was shockingly simple and incredibly delicious. Any guesses on which part of the meal excited me the most? Now, I love strawberries. As long as they are fresh strawberries. Strawberries baked in things? Not so much (although I did love strawberry frosted donuts as a little girl… but that phase passed). Needless to say, I was a bit skeptical. Luckily, this cake was a deliciously happy surprise. When I made the cake at home, I tweaked the recipe just a bit. 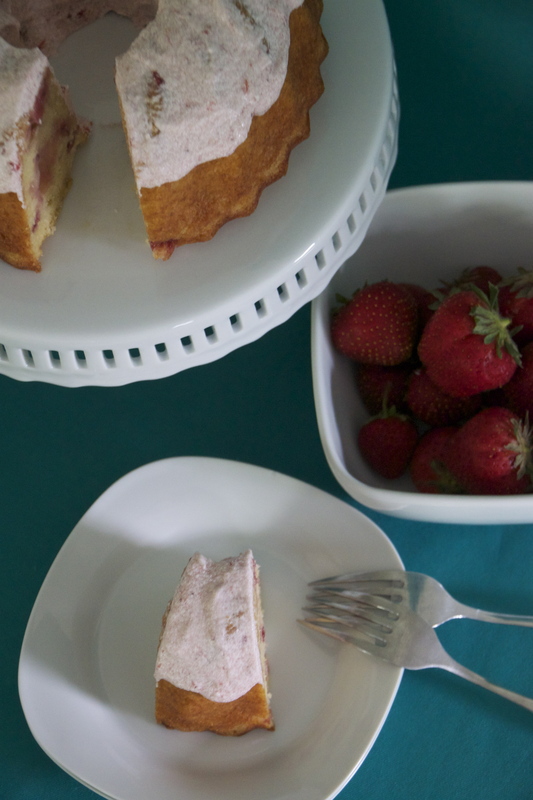 In both cases, the cake is delicate and moist, lightly sweet and kissed with a delicious strawberry taste. Not too much, not too little. Emily, the instructor of the class, said this was her favorite cake as a little girl. After one bite, you’ll know why. Preheat oven to 325F. 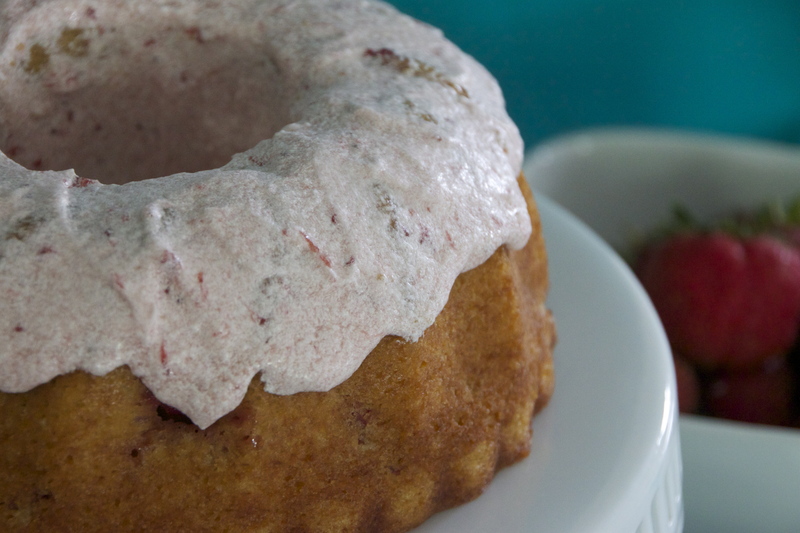 Prepare a bundt pan by generously spraying with a non-stick spray or grease with butter and dust with flour. In a mixing bowl, whisk together the sugar, oil, vanilla, orange liqueur and eggs. Beginning and ending with the flour mixture, alternately add the flour mixture and milk to the sugar mixture. Mix until just combined. Gently fold in the strawberries. Be sure to not over mix! Pour the mixture into the prepared bundt pan. Bake until the cake springs back to the touch, about 25 – 30 minutes. Remove from the oven and let the cake sit for 15 minutes in the pan. Turn the cake onto a cooling rack. Allow the cake to cool completely before frosting. While the cake is cooling, prepare the frosting. Cream together the butter and cream cheese. Add the powdered sugar and beat to combine. Add the vanilla and strawberry preserves and mix until desired consistency. Spread on cooled cake and enjoy!